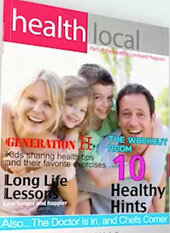 Health Local is a magazine-style monthly cable show that features segments on Healthy Hints, Exercises, Demonstrations of Easy to Follow Recipes, and advice from Health Professionals. Transform messages about physical activity and nutrition. Generation H (H stands for Healthy – in this segment, students share there favorite exercise of a healthy hints). The DuPage County Health Department also contributes many segments for the show. It also airs on the Lombard Channel 6 & AT&T U-verse Channel 99 (Lombard) on Sundays at 12 Noon, Wednesday at Noon and 11 PM, Fridays at 10 AM, and Saturdays at 5 PM. Check out a wonderful article about the show HERE. Single segments are also uploaded to the Healthy Lombard YouTube Channel. (www.youtube.com/healthylombard). That way, individuals who do not have cable can still view them.